One of my favorite new dresses is the Love Bird dress (*affiliate link) that was just released by my friend Linda of MCM Studio Designs. 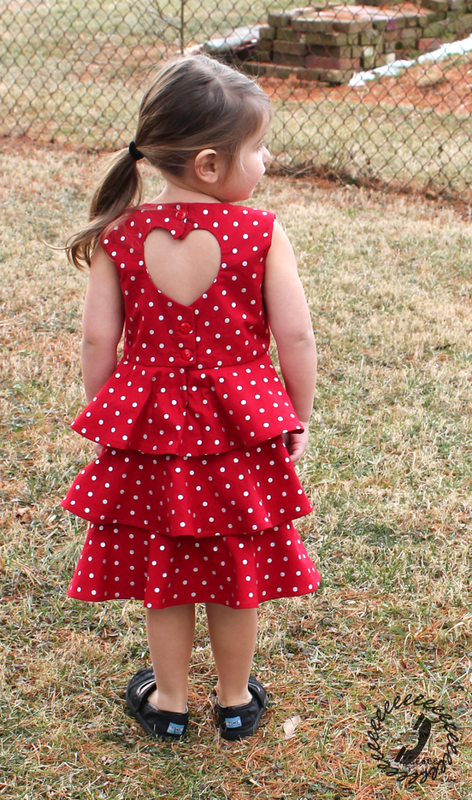 Its heart shaped cut out in the back is perfect for Valentine’s Day, but it would also work well for any special occasion. It was unseasonably warm last Tuesday so I took advantage of the chance to get some decent outdoor pictures. You’d never know it was February from the looks of these photos. Suddenly I can’t wait for spring, but there’s a lot more winter to come (it’s back down to below freezing), so for now I’ll just have to live vicariously through all my warm-weather-outdoor-picture-taking instagram friends. However, I’m completely in love with the three tiered skirt version. The tiers are designed with NO NEED FOR GATHERING so you know that makes me happy. There’s just enough flounce without the struggle of getting ruffles pinned and sewn nicely in place. 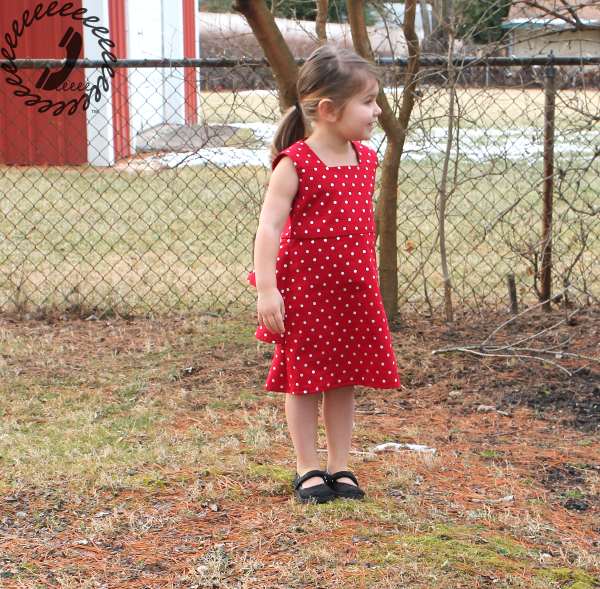 Seriously guys, this is a pretty quick sew once you know what you’re doing. 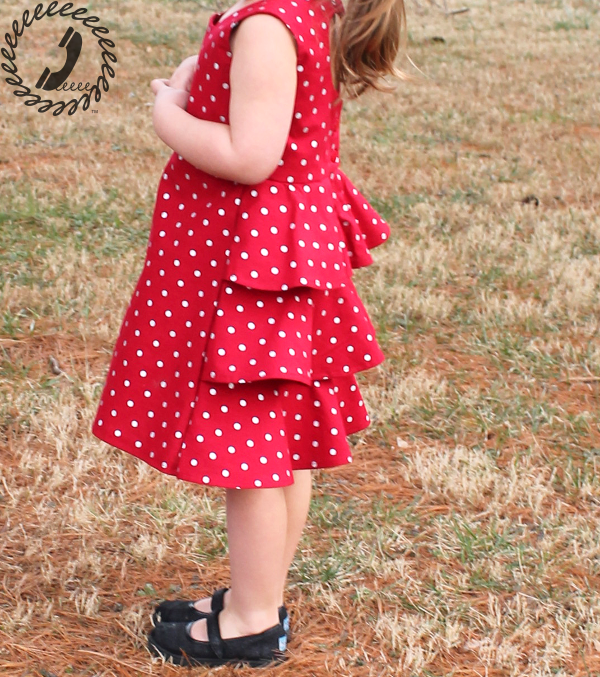 Eliminating the need for gathering makes short work of those cascading ruffles so there’s still time to get a dress done before Valentine’s Day this Saturday! There’s an optional apron that can tie around the back of the skirt and I think I’ll try that version next. The sizing is from 2 to 14 so I’ll have plenty of time to make different styles of this pattern for Bean. The bodice is fully lined and the button placket is easy to assemble. I’m always impressed with how well Linda’s illustrations describe the process. She’s a fellow Pattern Workshop (*affiliate link) Inkscaper so I love seeing how great her patterns look! I love the squared off neckline of the bodice and this sleeveless version. There are also cap sleeves you can sew, but I like the front to look simple with the surprise flair in the back. 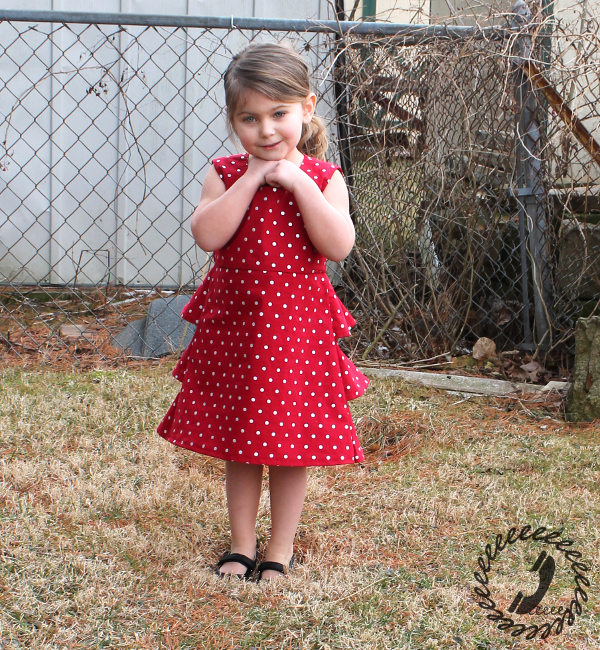 The polka dot fabric was in my stash from JoAnn Fabrics. I had to include the above pic to show the ridiculous spot where Bean insisted we should take pictures. This is the far back corner of our yard and the neighbors have some stuff just piled back there, she’s standing in a huge divot which is a reminder we need to fill it in, and with the bushes leafless for the winter it looks like barbed wire or something. She has an eye for photography that one, hehe. 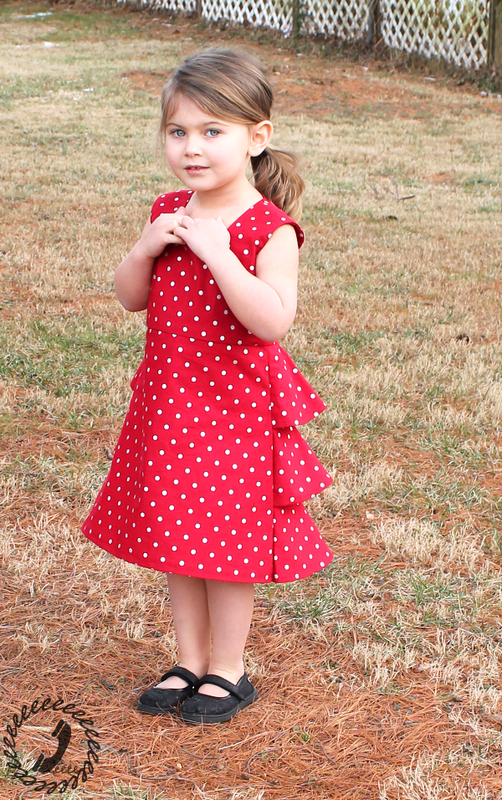 I just made a sweetheart dress and wondered how it would look with ruffles; it's PRECIOUS!!! I'm in love with this pattern, all the options are fabulous. And Bean looks amazing in red! Her "location" selection is awesome. I have a wonderful barn she could stand in front of…. Or a rusted truck? Such a sweet dress. I love it in the red dot! It is so good with the ruffles in the back Amy! And I can't rave enough about how well drafted those panels are. Not having to gather and yet getting these gorgeous cascades is amazing. It makes the sewing go so quickly on what is otherwise a complicated looking dress! 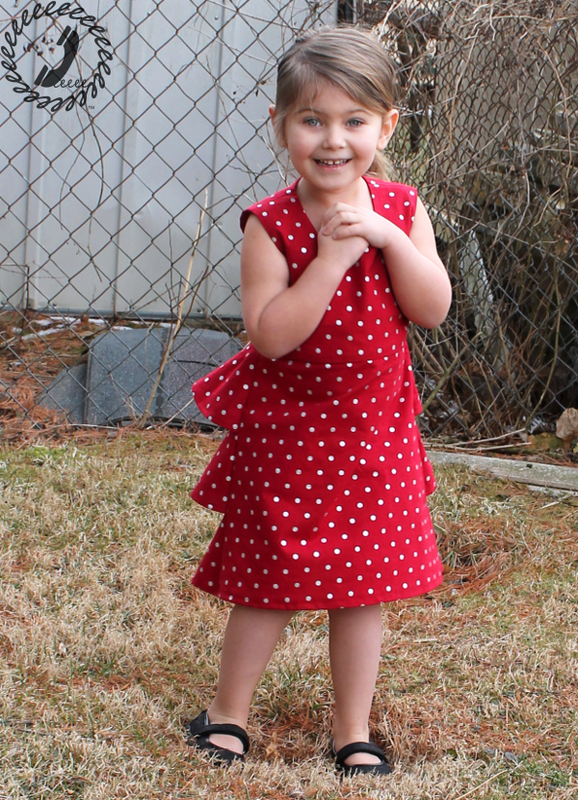 I like to call that last pic "my baby in a warzone"
I bought the red for a Christmas dress for a friend and the closer I got to completing the dress the more I new I needed to make Bean one with the leftovers. I almost mixed things up by making the ruffles a different color, but in the end I just loved that material so much I thought it should stand alone. Thank you! Ah, preparing her for a career as a news anchor, I see.